The shift of 30% of road freight over 300km to other modes such as rail or waterborne transport by 2030 (50% by 2050) as targeted by the European Commission. Within this framework and motivated by the necessity and opportunity for change in rail transport, Sustrail provides the approach, structure, and technical content to improve the Sustainability, Competitiveness, and Availability of European railway networks thanks to an integrated approach. A deliberate approach is adopted to guarantee innovations in both vehicles and rail infrastructures: Methodology, Implementation Timeframe, and Means of Application are the three key feature of this approach. 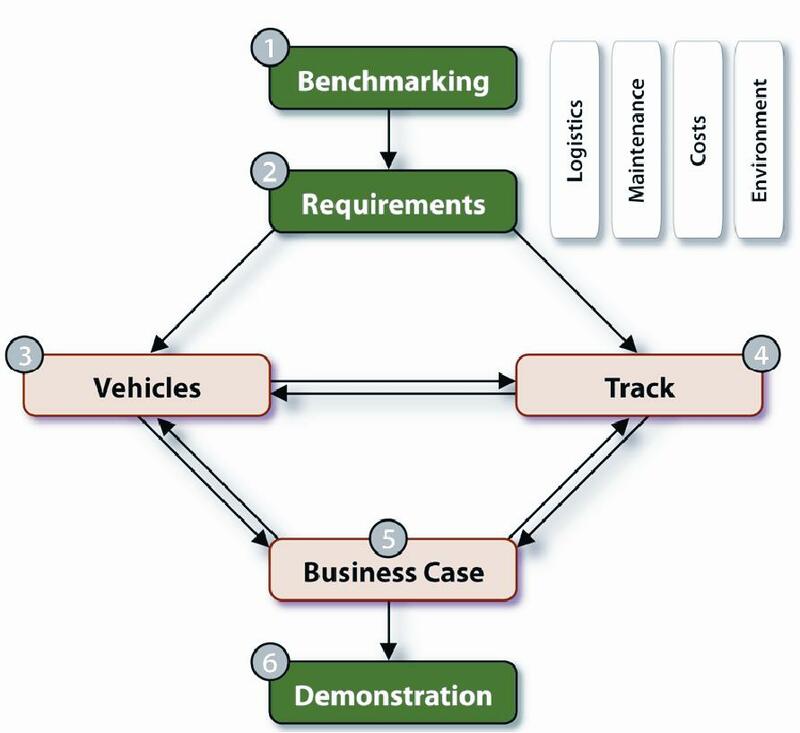 Methodology: employment of a holistic approach that leverages the skills of the consortium, including vehicles and their subcomponents, freight, passenger, track and substructure, and operational procedures. State of the art, benchmarking, and integration of ongoing rail projects are fundamental in the conduct of technical activities. Implementation Timeframe: we will develop both short term and medium term solutions. We are focused an actions that can have an impact today and in the near tomorrow. Several consortium members have very strict parameters on what can and cannot be supported. For example, rail companies that have recently retrofitted vehicle systems at large expense are not receptive to new short term vehicle requirements. However, other topics and other timeframes can be supported. SUSTRAIL will balance actions for short term impact with room to be strikingly innovative for mid term impact. Means of Application: Adoption of an integrated approach. The Sustrail solutions (in vehicles, track, and operations) will be demonstrated on real routes, which have been selected based on their geographic dispersion, their type (freight vs. passenger) and their frequency of traffic. Business cases will be set up, accounting for whole-system implementation, including phasing in of novel technologies and strategies for the equitable redistribution of whole-system savings.